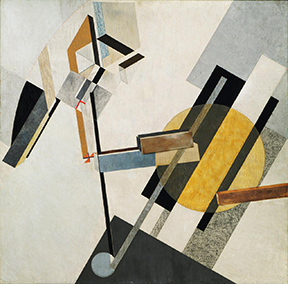 New York, October 28, 2016—The Museum of Modern Art presents A Revolutionary Impulse: The Rise of the Russian Avant-Garde, an exhibition that brings together nearly 300 works from MoMA’s collection, tracing the arc of a period of artistic innovation between 1912 and 1934. The exhibition will be on view December 3, 2016–March 12, 2017. Planned in anticipation of the centennial year of the 1917 Russian Revolution, the exhibition highlights breakthrough developments in the conception of Suprematism and Constructivism, as well as in avant-garde poetry, theater, photography, and film, by such figures as Alexandra Exter, Natalia Goncharova, El Lissitzky, Kazimir Malevich, Vladimir Mayakovsky, Lyubov Popova, Alexandr Rodchenko, Olga Rozanova, Vladimir and Georgii Stenberg, and Dziga Vertov, among others.